From the Monday's department... AustinSurreal.com presents! 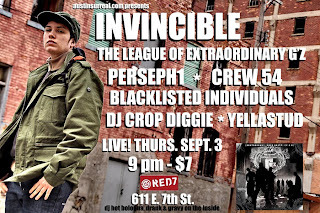 Invincible (Detroit, MI), League of Extraordinary G'z (Da COD, Dred Skott, Lowkey of Southbound) (ATX), Perseph1 (Houston, TX), Blacklisted Individuals (ATX), Crew 54 (Killeen, TX) and DJ Crop Diggie (ATX) @ Red 7 on Sept 3rd, 9pm, $7 at the door! "One of the most talented emcees I've ever heard black or white, male or female..."
"One of the best-written Hip Hop – scratch that – best-written albums to come about in some time"
"Invincible is one part emcee, three parts revolutionary, but the recipe is all Hip Hop." 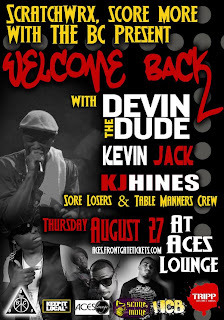 From the tease is over it's raining department... Devin the Dude @ Aces Lounge on Aug 27th! Kevin Jack, KJ Hines, Sore Losers and Table Manners Crew also strut their stuff. TX NORML is a smaller chapter of a national organization for the reform of marijuana laws (basically we're trying to get the legislature to reduce the penalties associated with marijuana convictions and overall, trying to get the stuff legalized). Texas NORML will have a booth at the event this Thursday. PLUS if you want to go and contact us directly for tickets, Texas NORML will get a 20% donation from those ticket sales!! So, please if you like hip-hop and want to see a badass show while also helping to support Texas NORML, then just let me know! Think about this; if just 50 of our supporters get tickets for the Devin the Dude show on Thursday, Texas NORML will get a $200 donation!!! So, if you want to get tix for Devin the Dude, just let me know by either e-mail or phone, and we'll see you there! From the can someone get me into ACL Fest department... Unspoken Levels needs your help in winning a spot at ACL Fest. Check them out. If you dig them. Vote. 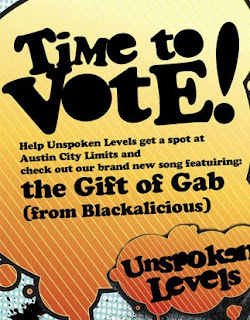 Come vote for this new Unspoken Levels song featuring Gift of Gab from Blackalicious! Austin's Unspoken Levels is trying to get as many votes as possible before Aug. 28 to win a spot at Austin City Limits! You can vote once per day, per account. Help spread the word and good music! 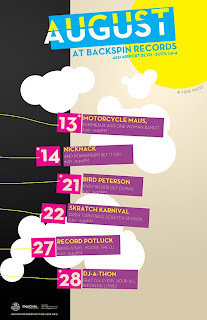 From the I've got an itch department... Scratch Karnival @ Backspin Records today, Aug 22nd! Been a while since I've heard the Scratch Karnival event throwing down. Now they've found a new home maybe they'll be regular again! 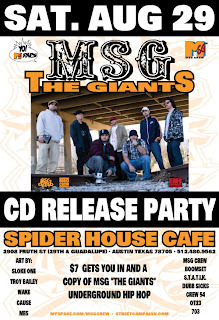 BYOB and scratch records and watch the Austin scratch kings work. I'd be there but I've got a volleyball bbq to host today! 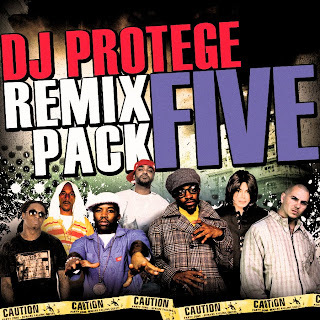 From the my manager quit today department... DJ Protege puts out another Remix Pack Vol. 5! 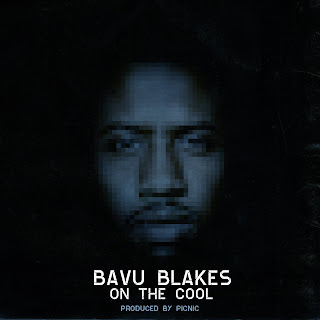 Listen to it below and leave some comments letting him know what you think! 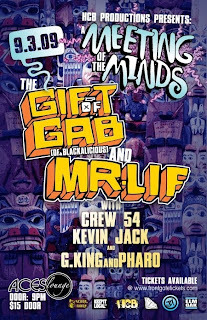 From the I'll be like your medicine department... HCB Productions Presents: A Meeting of the Minds with Gift of Gab, Mr. Lif @ Aces Lounge on Sept. 3rd! Also performing Crew 54, Kevin Jack and G.King and Pharo. 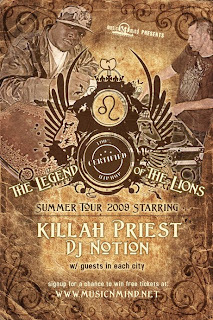 Gift of Gab (born Timothy Parker, in Panorama City, CA) is an American MC best known for performing in the Bay Area hip-hop duo Blackalicious with DJ Chief Xcel. He is also a member of Quannum Projects, a Bay Area hip-hop crew and record label, and has performed and recorded as a solo artist. Gift of Gab is often praised by critics for his rapping skills – Allmusic says he is “one of the very finest MCs to ever pick up a microphone”, “one of the best underground rappers in the business”, “his raps are jam-packed with internal rhymes, allusions, metaphors, ten-cent words, and amazing tongue-twisting feats of skill” , and he has been able to “redefine the art of lyrical technique”. 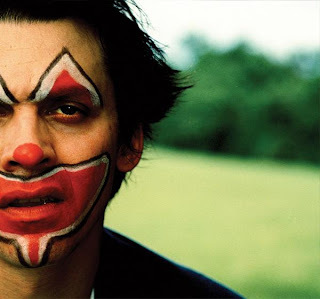 Peter Shapiro describes him as “a walking encyclopedia of MCing styles”, Pitchfork Media refers to his “astonishing verbal dexterity and enunciation”, Popmatters says he has a “nearly impenetrable reputation for style and innovation”, and Stylus Magazine calls him “one of the top MCs in the game”. From the WFH department... Check out Crew54's latest video, "Pay Us No Mind" then scroll down and watch the latest 54 Reality Show along with the Pac Div interview! From the paddle 12 miles department... 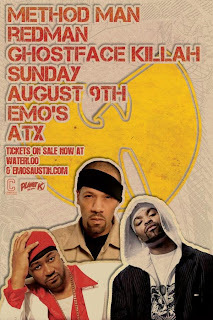 Method Man & Redman @ Emo's tonight, Aug 9th! 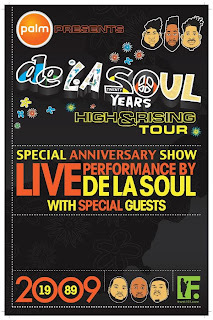 With Ghostface Killah, Duo Live and ATX own DJ Tats! Hmm. Boy I'm gonna try to make this. Holla at me if you're going! Method Man & Redman, also known as Red & Meth, Doc & Meth or Mr. Meth and Funk Doc, are a hip hop duo, consisting of rap superstars Method Man (of Wu-Tang Clan) and Redman (of Def Squad). The duo, who've known each other since they were kids, reunited in 1994 on tour and met again in 1995 in the recording studio of 2Pac's "Got My Mind Made Up" for his multi-platinum album All Eyez on Me. After this they had friendly battles freestyling with each other on Yo! MTV Raps which led to their collaboration single How High. They recorded many tracks together until they finally released Blackout! in 1999. A 10 years reunion sequel, Blackout! 2 was released in 2009.